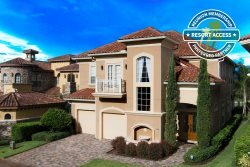 Are you looking for something exceptional for your vacation home in Orlando? Look no further - this beautiful home will be your Hidden Oasis providing you a chance to leave the 'everyday' behind. This home offers 3,600 square feet of tastefully appointed and light filled interiors, a secluded pool long enough to actually swim in, and plenty of privacy to enjoy the Florida sun without golfers buzzing by every 10 minutes. On your arrival you enter into a two-story foyer with gleaming travertine marble floors. In this home you can breathe, and you will appreciate the natural stone, tile, and Brazilian walnut floors. To create an allergen-free environment natural materials have been used - in furnishings (leather, cotton and linen), bed linens and towels (100% cotton), and area rugs (wool, cotton, and leather). The piano-room invites you in, just to read a book and spend a few moments of quality time by yourself, or to enjoy playing the piano to your heart's content. See what sheet music you discover in the drawers or bring your own. The view through the French doors to the garden and the oasis pool beyond opens up as you enter the great room and the kitchen downstairs. A dining table seating eight and island bar seating for four more ensure that everyone can eat together. The kitchen is fully equipped with a high-end gas cook-top and a professional, high efficiency, silent exhaust system driven by an outside fan motor. A wall oven, a quiet dishwasher, a spacious fridge/freezer, and a microwave drawer round out this well equipped kitchen. Comfortable seating area with a cluster of movable coffee tables and a SMART TV invite you to stay and relax after dinner with your family and friends. Step outside to enjoy dining at a table seating six, conversations at the patio sofa and chairs, and lounging around the pool in the teak steamer chairs surrounded by Florida's tropical nature. The living room upstairs provides another comfortable sitting area with a SMART TV and stereo equipment to enhance the movies' sound track. Adjacent is a mahogany, slate-bed pool table. A set of French doors lets everyone 'spill-out' to the house-width, 12-ft deep balcony where there is more space to enjoy the outdoors; a bar table for four and a sitting area for four. A hammock beckons beyond. After an active day visiting Disneyworld just a few miles away and other attractions that Reunion and Orlando have to offer, you deserve a good night's sleep. A spacious master bedroom downstairs features French doors that in a few steps lead you to a relaxing evening swim or an invigorating morning dip. You will be ready to enjoy another day in the sun. An en-suite bathroom with a spacious marble shower and a walk-in closet finishes the downstairs master suite. Upstairs you find another generously sized master bedroom with a King bed, a SMART TV, and ensuite bathroom. Another upstairs bedroom is beautifully furnished with a queen bed, SMART TV, and provides access through the French doors to the balcony overlooking the pool and conservation area beyond. Rounding out the bedrooms is a dormitory sized bunk bed room that sleeps six. Two of the bunk beds are extra long for for the fully grown but young at heart. The room has a fabulous, blue suede sofa perfect for enjoying the 65 inch SMART TV and for playing video games on the Playstation PS4 console. Welcome to Hidden Oasis. A perfect vacation is waiting for you. While staying in this property you and all of your party will be able to use the majority of Reunion's amenities such as;6 swimming pools, children's activity program, bike hire, boutique spa, on-site restaurants, and bars. Only if you wish to access an additional 5 of Reunion’s Pools including the Water Park and the Tennis or Golf will you need to be registered as a House Guest. There is a limit to the number of days that can be appointed to house guests. Therefore the house guest registration is not for the entire length of your stay, just the specific date(s) you wish to access the Water park, Tennis or Golf. There is a registration fee which is for one day. This is for you and all of your party - NOT EACH. If available, additional dates can be purchased. You are required to be registered for your desired date(s) at least 5 business days before your arrival. Once registered, your dates cannot be changed, the passes cannot be credited or reissued even if the water park is closed for any reason or if they are not collected or used. Once you are registered you and all of your party will be able to access 5 additional pools including the Water Park, Golf, and Tennis. Each of these activities requires an additional fee, the Water Park is $18 per Adult and $12 per Child payable at the entrance, Golf is $125 per person during low season (Jun to Dec) and $185 per person during Peak season (Jan - May) and Tennis is $20 for one day. Overall, a really great place. I would definitely rent there again. The pool and backyard was the highlight, even though the house was also spectacular. Very secluded. Just beautiful.